Reversing Time: Throwback Analysis of “Dishonored,” Part I. You might recall that I undertook my first video game research several years ago; a few weeks back, I published the first chapter from that work as part of my series on “Majora’s Mask.” If you follow “With a Terrible Fate” on Facebook, then you know that I am analyzing “Dishonored” next. What you don’t know is that my first research project also had a rather long chapter on “Dishonored.” So, prior to releasing my new analysis of the game, I am publishing my older work on the game, in three parts — so stay tuned to see where the analysis ends up. Note, again, that this older work is not altogether reflective of my current stances on video game theory. It also focuses much more heavily on the phenomenology of games — that is, what it is like to experience playing a particular game — whereas my current work is more focused on the architecture of games as aesthetic objects. Nevertheless, I hope readers will enjoy the piece and get excited for the imminent release of totally up-to-date work on this riveting game. as it has to the others before you. but know that I will be watching with great interest. “Dishonored” chronicles the story of Corvo Attano, the Royal Protector to Empress Jessamine Kaldwin of Dunwall and her daughter, Princess Emily. Dunwall is a city set in the early industrial period, beset by a rat plague that might be likened to the Black Death of the 14th century. Corvo returns from a trip to neighboring cities where he acted as the Empress’s proxy in seeking help on the plague outbreak; after delivering his report to the Empress, a group of dark-garbed assassins materialize at the outlook upon which Corvo and Jessamine are conferring, occupying Corvo while their leader kills the Empress. They then disappear, leaving Corvo to be framed for the murder by the traitorous Spy Master Hiram Burrows, who uses the assassination as opportunity to take control of Dunwall’s government as the Lord Regent. On the day intended for Corvo’s execution, an insurgent group known as the Loyalists, who claim loyalty to the original Kaldwin line, springs him from prison. They enlist Corvo’s help in finding Emily, who had been hidden away in a brothel by the Lord Regent; and eventually, they task Corvo with bringing down the Lord Regent himself. Thereafter, the Loyalists betray Corvo, making an attempt on his life so that they may realize their true goal: installing Emily as a figurehead and ruling Dunwall through her. Corvo is saved by the actions of one Loyalist who remains faithful to him; tasked with killing Corvo, this Loyalist instead gives him a nonlethal dose of the intended poison. Corvo eventually finds his way back to the Loyalists, subduing them and rescuing Emily. Superimposed over this plot is The Outsider: a mysterious God-figure and religious icon who exists outside space, time, and morality. On the first night Corvo spends at the Loyalists’ hideout, he is visited in an ethereal dream-like sequence by this entity, which to the entire world appears like a perfectly ordinary man of 22 or 23 years’ age. He tells Corvo that he has “chosen” him because of the pivotal role he will play in events to come, and endows him with The Outsider’s mark, which enables him to employ the world of magic, of which The Outsider makes him aware. He tells Corvo that how he uses these gifts falls upon him, but that he “will be watching with great interest.” The Outsider, in essence, is a supernatural spectator, placing a bet upon Corvo in the form of supernatural ability and watching him play out his quest for reclamation of honor. In the Bard’s classic tragedy, Macbeth, a Scottish lord, encounters three witches who divine him to be the future king of Scotland. Macbeth, goaded on by his wife and his own ambition, uses the weight of this prophecy, endorsed by the acquisition of another noble title the witches foretold (Thane of Cawdor), to murder King Duncan; he is crowned king thereafter in accordance with the prophecy. His brief and bloody reign is spent seeking to suppress all dissent and knowledge of his usurpation, with both him and his wife driven to madness by the ensuing guilt over their actions. The witches, to whom Macbeth returns to seek assurance of further reign, foretell his end, which, as was the case with their earlier predictions, comes to pass. Here, Freud lays out his classic model for the human psyche. The mind, he says, initially exists in the undifferentiated well of libido known as the id, which is the seat of the pleasure principle and death instincts. The mind’s interaction with reality compels differentiation of the id into an ego, which serves as its interface with the external world. Loosely interpreted, the superego develops out of the ego as a result of expectations and societal prohibitions, serving to internally police the activities of the ego in accordance with external expectations. While the psychiatric and psychological communities have largely discredited Freud’s theories, they are still useful templates in the domain of literary theory and interpretation. In this treatment, Freud’s model of the mind will serve as a template from which to construct our third meta-role model. One of the most basic aspects governing the nature of player’s association with his on-screen avatar is perspective. If we take the time to examine how perspective typically functions in games, we will find an easy way into what makes “Dishonored” theoretically salient. The way in which the player perceives the avatar’s place in the game’s reality, as well as the way in which the avatar interacts with that reality, create a two-part framework for the player’s understanding of his place within that reality. These two perceptual categories may be broken down into two subcategories, as follows. The camera, serving as the player’s window into the game’s reality, is positioned at a location external to the avatar. This is most typically understood with the camera following the avatar from behind, though third-person games typically give the player the capacity to swivel the camera around the avatar at will. When considering the ways in which video games impede mindfulness, this vantage point is high on the list. In many ways, this view tends toward the player having a “god perspective” – that is to say, they understand themselves as manipulating the avatar, rather than directly associating with it. While there are methods by which third-person games draw players in to associate with the avatar, on the whole, this level of separateness will always limit that degree of association. The camera is made to simulate the visual input of the avatar, creating the impression of the player seeing through the avatar’s eyes. This carries with it a level of intimacy which third-person games are hard-pressed to convey: when the player’s visual access to the game’s reality is limited to the avatar’s perceptual field, we might rightly say they are forced to associate with the avatar, because the avatar is their sole point of entry into this reality. This perspective is often associating with shooting games like “Call of Duty,” so much so that an entire genre has evolved surrounding the marriage of these two ideas: the FPS, or ‘first-person shooter’. The genre, focused more on combat than on character development, may be the most natural implementation of the first-person perspective because it circumvents a major question raised by the first person perspective: given that a game and the characters therein are scripted, how might the player impress his identity on the avatar in the way he is seemingly invited to by the first-person perspective? We explore this difficulty further in consideration of the second perceptual category.  As the name suggests, this subcategory features an avatar which does not speak – at most, the avatar will have very sparse, decision-making scripts, one of which the player is prompted to choose at event junctures in the storyline. Even then, the avatar does not literally speak these scripts; speech is merely implied. This lack of voice and automatic dialogue compels the player to associate more with the avatar because the separation created by an active avatar is not present. Yet the silent avatar goes further in affecting the overall tenor of the game. One might naturally think that a silent avatar is somewhat passive, and this is not far off the mark. For, paradoxically, this very dynamic which allows the player to act in freer association with the avatar also makes the events of the story far more dependent on the world external to the avatar. This, too, underscores the limitations of the medium of video games regarding the player’s entry into the reality: the player, one who can actively evaluate situations and adjudicate them in real-time, is hard-pressed to find an organic sense of interaction in a pre-written reality and its chain of events. When his representative (i.e., the avatar) is silent, this allows the player a greater sense of being within the reality, but this also puts in question the avatar’s sense of actively bringing about the events within the game’s plot. One solution to this paradox, as we shall see in “Dishonored,” is modern gaming’s introduction of more frequent and multifarious choices to be made by the player. For a long time, gaming has been more or less focused on linear plotlines: the player’s avatar would progress through scripted story events, leading to the predestined conclusion of the game. However, gaming has increasingly trended in recent advancements toward an experience more varied based on the player’s choices. The increase of choice has manifested in different ways. At its most superficial, there is the impact-less choice of the order in which one completes story-advancing events; similar is the choice mechanic of allowing players to develop the attributes of their characters in different ways. While both of these undoubtedly affect the way in which the player associates with the game, they are superficial in the sense that they do not alter the game’s main plotline globally. In contrast, some games’ choice junctures greatly affect the storyline. 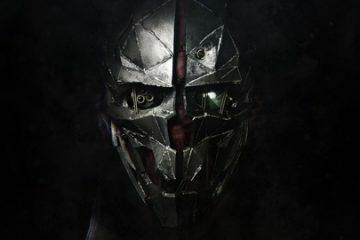 “Dishonored” is a prime example of such a choice paradigm: the game has two distinct paths, called “high chaos” and “low chaos.” By making more choices that align with one path, the player determines a different ending to the game, along with altering the state of Dunwall later in the game. The logic of the game’s paths proceeds as follows: the more people killed at Corvo’s hand, the more chaos is spread and the darker Dunwall becomes because the rat plague is propagated. The presence of more dead bodies means more feed to sustain the diseased rat population. The killing of guards also reduces order and draws resources away from managing plague outbreaks by requiring them to instead be invested in suppressing unrest. In contrast, Corvo’s moving in the shadows and achieving his ends with non-lethal means reduces chaos by avoiding the above causal chain. Accordingly, high- and low-chaos choices are built into virtually every aspect of the game. Main assassination targets can be neutralized either by lethal or nonlethal means – in infiltrating enemy strongholds, Corvo can either slip past guards using stealth, or fight his way through with brute force. Given the way in which choice is integrated into every facet of gameplay, one might understand why game designers would traditionally subscribe to linear, convergent storylines: one thought here is that choice-affected storylines simply require far more work. In crafting “Dishonored,” Bethesda essentially created two games in one; the high-chaos and low-chaos options, divergent from one another, each only truly tell half the story. Synthesizing the two paths is the only way of attaining the most holistic view of “Dishonored.” This could be one reason why the game is relatively short at a ~10-hour playthrough: the potential divergence of choices at any given moment makes development an intensively integrated process. It may not seem that much choice is provided by only a bilinear path, but, when combined with the overt presence of more superficial choice (i.e. the capacity to choose different supernatural powers for Corvo to develop, and a multitude of ways to carry out objectives on either of the two paths – particularly the high-chaos path), the amount of choice in “Dishonored” is a solid start in resolving the problems of avatar agency discussed above. The player is able to associate with the avatar and retain a level of responsibility for his actions through the paradigm of choice; in point of fact, responsibility for one’s actions is one of the game’s main themes. Enter Corvo Attano, the fallen hero on a mission to clear his name and restore the proper lineage to the throne of Dunwall. As Royal Protector, and thereafter as the Empress’s alleged assassin, Corvo is known throughout Dunwall; as Piero, the Loyalists’ craftsman, puts it, “everyone knows your face,” which is why he takes it upon himself to craft a mask for Corvo to wear on his missions – to wear something that “brings terror to them.” Curiously enough, everyone in Dunwall knows Corvo’s face except for Corvo. 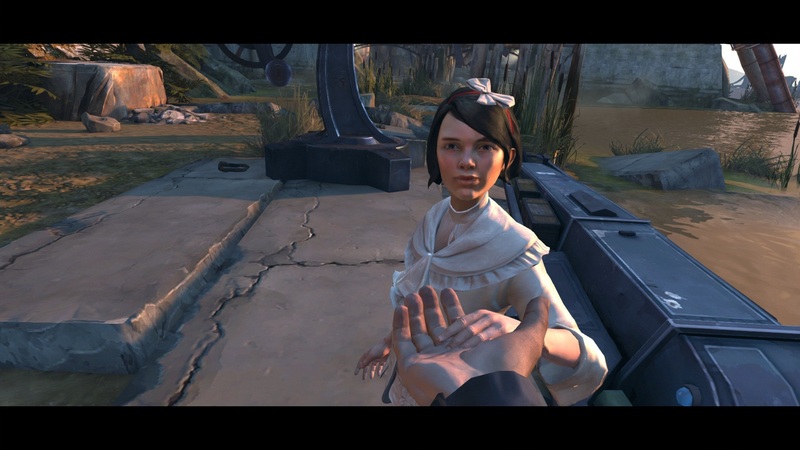 By virtue of the game’s being exclusively experienced in a first-person perspective, the player never sees Corvo’s face directly. The only times he sees it rendered are on wanted posters following Corvo’s initial escape from prison (posters which are quickly updated to instead show his mask), and in several intimate moments along the low-chaos path. After Corvo saves Emily from the Lord Regent’s clutches, she lives with him at the Loyalists’ hideout, before Corvo is betrayed and the Loyalists kidnap her for their own purposes. During her stay, she draws many pictures for Corvo, some of which are of him. In the low-chaos story arc, she draws one such picture of the Royal Protector’s face, labeled “Daddy.” In another large portrait beside Corvo’s bed, we see the difference between high- and low-chaos stories: in high-chaos, Emily draws this portrait as a picture of Corvo’s dark mask, whereas in low-chaos she draws his actual, smiling face. 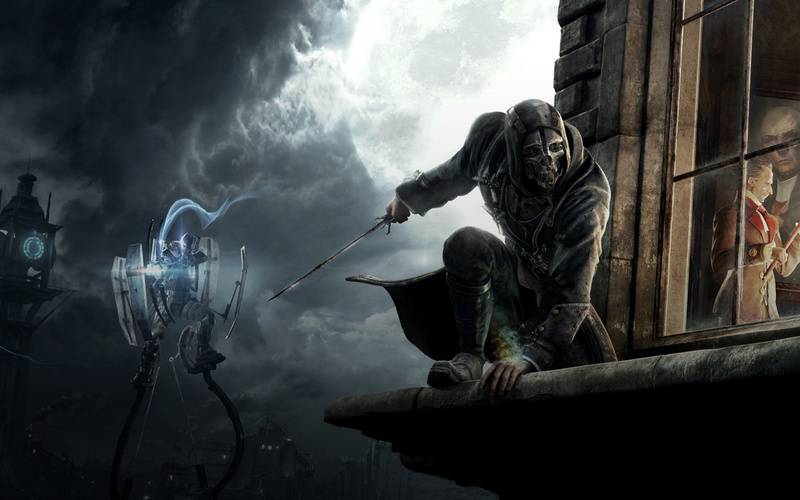 In point of fact, Emily’s identity as Corvo’s daughter, a fact heavily implied by external evidence such as the above-mentioned drawing, is only accessible to the player through the perceptions of NPC’s – by virtue of the silent avatar, the player fights the entire game to save his daughter, yet only learns that this is the case late in the game. The player’s perception of Corvo is completely dependent upon the way others perceive him – and that perception, in turn, is formed by Corvo’s own actions. How does this relationship between internally generated choice and externally impressed self-understanding inform the player’s understanding of Corvo, and, by proxy, himself? Furthermore, what role does The Outsider – looming in the background, yet so far unanalyzed – play in this dynamic? In comparing the established framework of “Dishonored” with “Macbeth” and interweaving appropriate psychological precepts, we will formulate the next manifestation of the meta-role: a framework we shall term the ‘prophesied meta-role paradigm’. Interestingly, the non-lethal means are almost invariably worse than swift execution. For example, the brothers who are eventually found to be holding Emily hostage may either be killed, or sent to a mine owned by a local boss, who cuts out their tongues to prevent their stories ever being told.